Getting into WaterFed® cleaning can be one of the best things for your business. But, when you are just starting out, it can be confusing how many choices there are! This guide explains the basics of Water-Fed Carts (sometimes called Water Carts or Pure Water Systems) so that you can make the best decision for your company. Not sure what WaterFed® is? Read this introduction first. Why do I need Pure Water? Have you ever washed your car and let it air dry? Once all of the water is evaporated, you end up with spots all over. That’s because the water evaporated but the minerals that were in the water got left behind. Same thing with window cleaning. 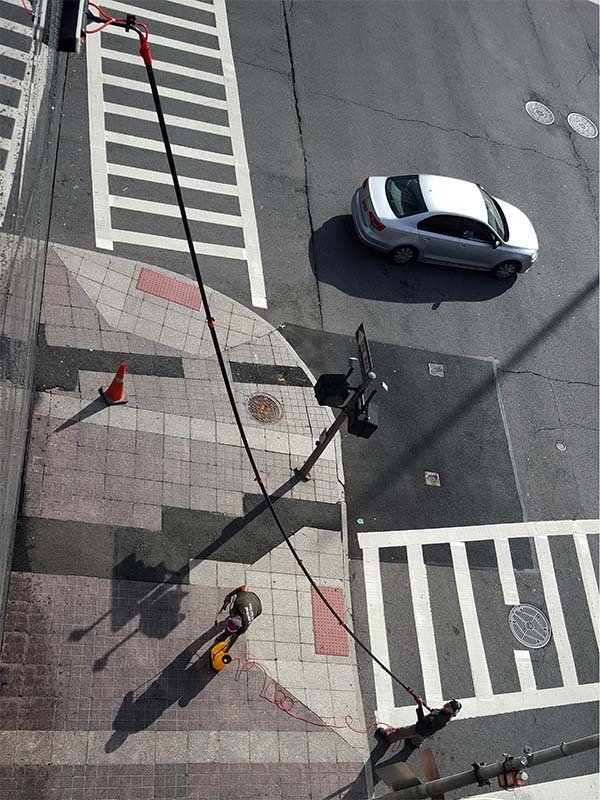 If you use tap water with your WaterFed® Pole, you’ll end up with spotty windows. 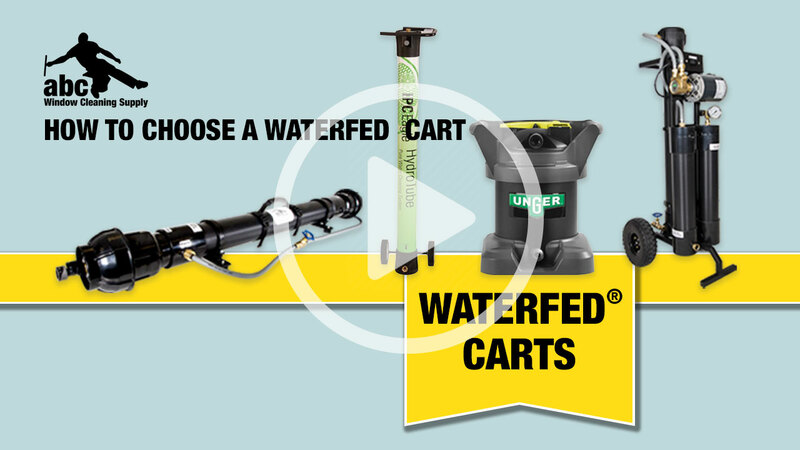 With a WaterFed® Cart, you’ll remove all of the dissolved solids from the water, leaving it to dry spot free! HOW MANY HOURS PER WEEK WILL YOU USE IT? Once you’ve decided to get into pure water window cleaning, your most important decision is whether to get a DI Only or High Efficiency Multi-Filtration system. Either will get your water clean and allow you to do WaterFed® cleaning, but they do have some important differences. DI Only systems use one kind of filtration, Deionization Resin. This resin will get you to 0 TDS (Total Dissolved Solids). Some DI Only systems use several DI filters in a series, but they still only use one kind of filtration. These systems are very easy to use. High Efficiency Multi-Filtration Systems use a series of different types of filters to purify your water. They start with a Carbon Sediment Filter, go through a Reverse Osmosis Membrane (this is the workhorse of these systems), and finish with a DI filter. The earlier filters prolong the life of your DI filter and make your cart far less expensive to operate in the long run. These systems are sometimes referred to as Multi-Stage or RO/DI. There is a bit more of a learning curve with these systems than with the DI Only (don’t worry, Triple Crown Systems come with written and video quickstart guides!). Though either will get you to pure water, the operating cost difference between them is enormous. Think about cars with low MPG vs high MPG or think about inkjet printers vs laser printers in terms of cost to operate. You need to decide whether low upfront cost or operating cost is more important to you. Consider how you are going to transport the system. Systems come in all shapes and sizes. Smaller ones usually have a handle for carrying and larger ones come on a cart with wheels. Figure out which one you prefer and make sure that the one you choose will fit in your vehicle. If you aren’t ready to dive into a high end system right out of the gate, consider getting a system that offers upgrade options. There’s nothing worse than getting a system that you have to completely replace down the line! Several systems such as the SG1, NXT, and IPC HydroCart have base models that you can add-on to. You can add a pump to nearly any system. 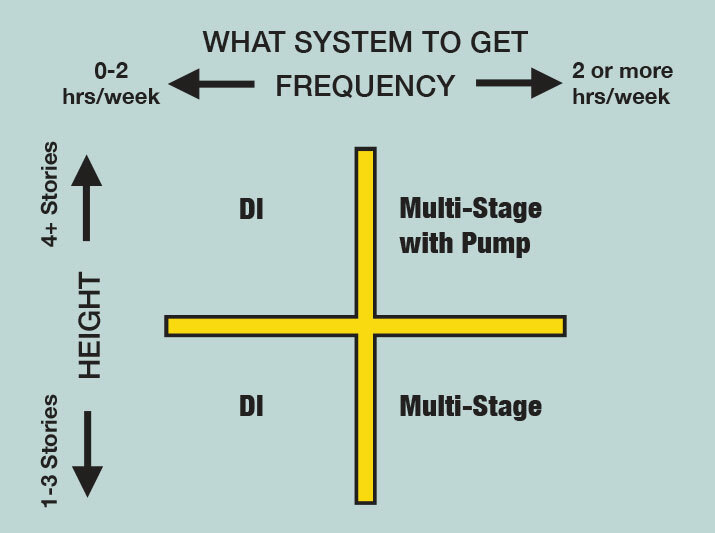 For convenience some systems have a built in way to add a pump (see upgradability above) or already have a pump included. In most cases pumps are optional, but something you’ll probably want at some point. You need to do high windows with a multi-filtration system. Your water pressure is poor. You want to work faster.